RachBurns.us: Skin colors are working now! Skin colors are working now! Leana is finally working out! 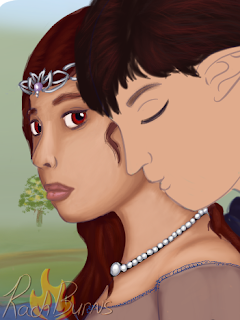 This is the smoothest I've ever done a skin color...super thanks to Myriena on deviantart for the palette used! Now, Valeon's should come together just as quickly and I'll bustle around to get their clothing properly painted. And can you believe it? Her nose has finally attached to her face! It doesn't look like she's wearing one of those nose-disguises anymore!